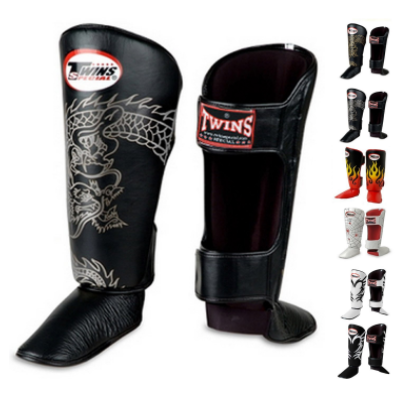 One of the essential equipment needed by all kickboxers and Muay Thai practitioners are shin guards. They provide a protective padding that covers an individual’s shin and instep. This padding is a safety measure against injuries that may occur during drilling or sparring sessions. The padding running along the shin bone is great for minimizing the damage taken when checking and throwing kicks. The foot padding is important for reducing the pain felt when your foot clips a training partner’s elbow. Shin guards are also critical to softening the impact taken by your training partners as it cushions and distributes the force over a larger surface. Your teammates will be grateful to not have to feel your shin bone digging into them. Below are the 7 best shin guards for beginner and intermediate strikers, listed in no particular order. Top King offers a diverse selection of shin guards that is appealing to a wide range of individuals. Their shin guards are available with the simple and classic look as well as flashy ones for individuals wanting to stand out more in the gym. 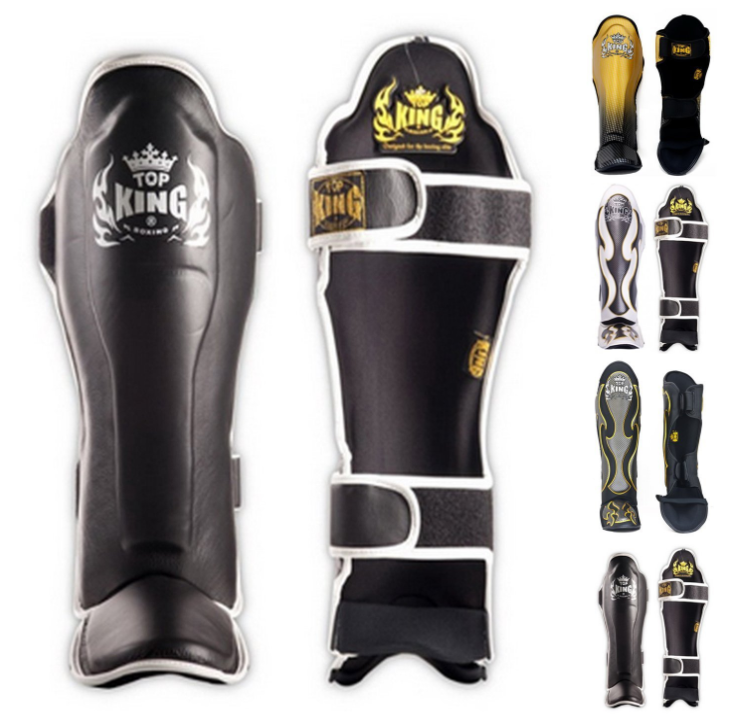 Top King’s shin guards has a durable leather construction and thick padding to protect the shin bone and the instep. In addition to that, Top King designed their shin guards with a raised bar running along the shin bone for extra protection. Due to its tough build, this shin guard requires multiple training sessions to break it in and maximize its comfortability. To secure the shin guards in place, there are a pair of hook and loop straps on each one. Furthermore, it does not require a metal or plastic D ring for looping the strap through. Upon securing the hook and closure straps, the Top King shin guard does a good job of staying in place and not sliding around. The top portion of the shin guard is raised and has a rounded edge, which covers just below the knee caps. Top King’s thick padding is great for protection, but the downside is that it can be kinda bulky. Additionally, the foot padding may run a bit long for some individuals as well. The Top King shin guard is a fantastic selection and its characteristics lends itself to advance strikers as well as individuals new to striking. The Regenesis striking shin guard is one of many choices available from Hayabusa. One feature that makes it stick out from other shin guards is its I-Strap closure system. 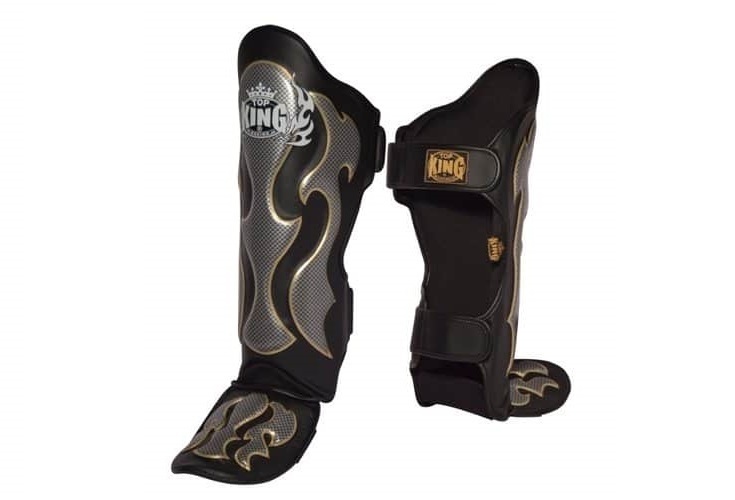 This system consist of having an additional piece of padding for the calves and also double as a component that reduces the chance of the shin guard moving around and offers a better fit as well. The exterior of the Regenesis is composed with Hayabusa own blend of synthetic leather material they call Vylar-2 engineered leather. This material is designed to be tear resistance and tougher than the average synthetic material. To complement the durable exterior, Hayabusa integrated the inner lining with a moisture wicking material. The inner lining will help keep your legs dry, but it also means the Regenesis shin guards must be properly dried out after each training session, so that there are no odor build up. The Regenesis has a raised padding for the shin bone and foot portion as well. Instead of a simple bar, the shin padding has a very distinct look. The Regenesis is relatively pricey for using synthetic leather, however its I-Strap calf padding makes up for the extra price. The calf padding does make the overall setup quite large though. Despite the overall bulky size, the Regenesis is not that heavy relative to the amount of protection it provides. The Regenesis from Hayabusa is one of the most protective shin guard available on the market. Fairtex﻿ competition shin guards are handmade in Thailand with quality construction. This particular model is stitch-free, so there are no abrasive stitching to deal with during training. Fairtex has changed their design to not need metal fixtures for securing the hook and loop straps. These competition shin guards from Fairtex has a dual layer of foam padding that is not as thick as some of the other options on this list, but it still has enough padding to protect you from damages encountered during training. The exterior of the Fairtex shin guards is made with synthetic leather. It also has a silkscreen design that differentiates which shin guard is for the left and right leg, which is convenient when rushing to put it on before class. This Fairtex shin guards is one of the most well-balanced option in this article since it is protective without having too much padding that it limits an individual’s mobility. The Predator is an excellent product from Venum. They are handmade from Thailand and pre-curved for comfort and fit. The Predator’s “Skintex” leather construction is simply their own special synthetic leather material that is known to be tough and durable. This shin guard uses the basic hook and loop closure system. However, its hook and loop straps are unique since they are wider than most. This wide design is great for providing a larger surface area to grip on the back of the leg and preventing the Predator from shifting around. Its multi-density foam is a feature that improves the Predator’s ability to cushion against hard impacts. There is also an extra layer of padding for the shin and instep. Venum has also designed this additional layer to boost the shin guard’s physical appearance as well. Furthermore, Venum ended up developing a product that has a tasteful and aggressive design. 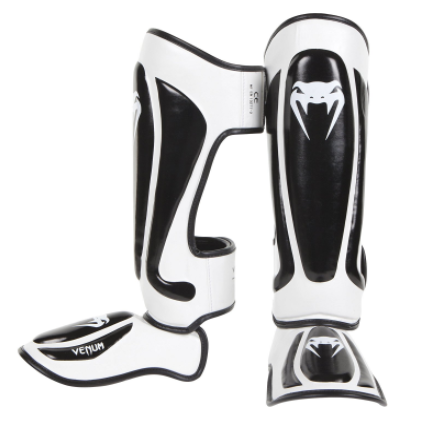 Not only is the Predator a flashy shin guard option, its characteristics is ideal for sparring in the gym and for use in amateur competitions. 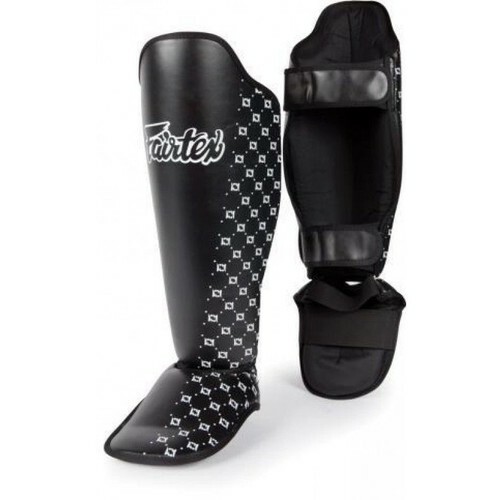 Twins Special shin guard is available in many different colors and graphic designs. Individuals that prefer the minimalistic look should check out their Classic shin guard lineup. The Twins Special shin guards has thinner paddings than some of the other choices on this list. Even though this particular Twins shin guard does not have additional raised padding for the shin or instep, their high density foam provides plenty of protection for reducing the impact felt during shin to shin contacts. In addition to that, the lack of padding is great for individuals who prefer lighter shin guards over the more protective but bulky ones. However, the padding for the foot is thin enough that accidental kicks clipping the training partner’s elbow will inflict more pain than the thicker padded shin guards. The Twins shin guard has a pair of wide Velcro straps for hugging the back of the leg. Unlike the standard single strap hook and closure system employed by most shin guards, Twins shin guards have two separate pieces that overlaps and attaches to each other. Even though this design might allow for faster access and removal, it does not tighten down and provide a secure fit as well. The Twins Special shin guard is an awesome choice for strikers who enjoy lightweight shin guards. The Deluxe shin guards from Windy is a beautiful piece of equipment. It has a clean and attractive appearance while meeting all the needs to guard its user from harm. The Windy Deluxe model has a slim build and contoured padding that maximizes comfort and fit. As shown in the image above, these shin guards have multi-layer padding that successfully achieves its goal of softening the blunt force experienced when throwing a hard kick. The exterior material is synthetic leather with a canvas fabric for the inner lining. This particular pair of shin guards may seem pricey because of its synthetic leather construction, but it is a handmade product from Thailand and its impressive design makes it well worth the price. Furthermore, its quality stitching and construction is resilient at resisting wear and tear. One negative aspect of this Windy shin guards is how the two hook and loop closure straps are quite thin and its stickiness may not be that great. 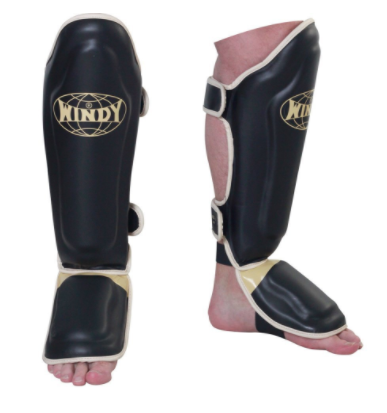 Overall, the Windy Deluxe shin guards should be desirable for individuals who highly value their mobility and prefer the slimmer profile shin guards over the bulky ones. 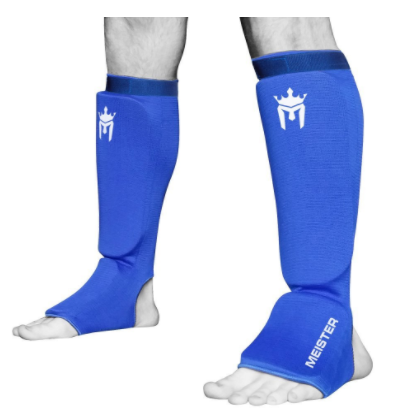 Although Meister is not a huge brand name in the martial arts industry yet, the shin guards shown above is a great choice that is extremely budget friendly. It also stands out from the standard hook and loop closure system by having a stretchy cloth cover your lower leg and leaving only the heel portion exposed. The only downside to this particular design is that it may get hot over long training sessions. Despite having moisture wicking capability, this cloth sleeve is obviously not as well ventilated as the standard Velcro straps design employed by the other shin guards above. One thing that makes this Meister product different from the other shin guards with this sleeve feature is the hook and loop strap available at the upper edge. This addition allows individuals to lock the top portion securely after the user slide their foot in place. 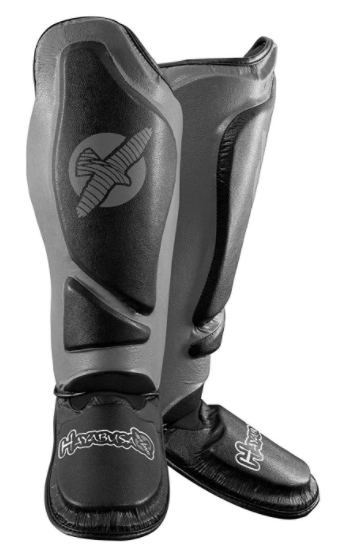 The Meister cloth shin guard may be the least protective of the shin guards mentioned in this article, but its design allows it to be used comfortably in various MMA standup and grappling scenarios. Therefore, this Meister shin guard is recommended to those interested in a pair of ultra lightweight shin guards that is versatile enough to be used for more than just striking drills.